I'm not a big fan of this actress, she was annoying in 'Friends' (well, they were pretty much all annoying) and I avoid any movie she makes like the plague. So when I found out she was this week's subject on Caricaturama Showdown 3000, I thought there was no chance I was going to participate and give my time caricaturing someone I couldn't stand...but she does have a bunch of interesting features to maul, and as famous cartoonist Ralph Steadman once said, "Caricature is the next best thing to shooting somebody" (don't worry Jen, I don't hate you that much!). Saying that, besides the manly chin and neck, I could have been a lot more insulting with the caricature. I think I went pretty easy on her in the end. 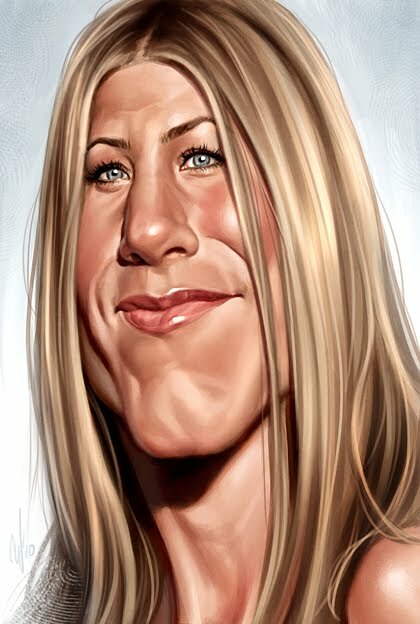 This is one of my favorite caricature paintings... FANTASTIC likeness, technique, and exaggeration. Now she looks related to Fabio. I appreciate your restraint—contempt can be a very dangerous motivator. Your comments made me wonder how much a caracaturist's feelings about a given subject effect the treatment of the drawing. You sure didn't go for the 'pretty' here, so I wonder if you'd lean that way more if you liked the person.?? gracias por deleitarnos con tus obras. Sagan- Thanks mate. Very happy to hear. R. George R.- The fingerprint brush and many other of my custom brushes can be downloaded for free from the sidebar link. Michael- Definitely. I imagine if I found her attractive (or liked her acting) I would have accentuated her prettier features like her eyes and maybe subconsciously or even intentionally toned down her more prominent features. So how do you decide when to use Photoshop's smearing vs. Painter's just add water tool for blending? Ha ha ha that is classic! So unflattering, yet the likeness is spot on! How did you do it? Great! Michael- This was painted directly in Photoshop over a rough digital sketch. Photoshop's blending gives smooth results which was good in this case for female features. With the Nick Cave piece, Painter's blending gave a more textured, painterly finish. Craig- Thanks! The unflattery(?) came first then I refined the likeness. Paying attention to little minute details in a subject's face/expression can really help capturing a good likeness. Damn, nailed it. I'd love to see the version where you don't hold anything back. I don't see what you did this is exactly what she looks like in real life! Joey- Thanks! Yeah, she turned out a bit too pretty for my liking. I've seen some episodes of Friends, but I haven't seen any movie with Jennifer Aniston in, and I've never understood her appeal. She seems to have taken over Goldie Hawn's mantle playing annoying, whiny, squealing, spoilt rich girls. Saying that, she does have an unusual face which is a gift for a caricaturist, and this is an exceptionally well done piece of work. Damn your good! Thanks for the laugh. Amazing work as always. Very interesting caricature. When I first saw it (before I noticed the headline), I immediately thought, "Streisand!!" Within a second, though, I saw the Aniston features. Quite impressive to conflate the two! I would not have recognize her if the name wasn't displayed. The image really doesn't capture her well; being distorted and grotesque doesn't bring out the essence of this person. You over did it with too little sensitivity and subtlety. You need to study your subjects first. Anonymous- I'm guessing you're a fan of Jen (or you are Jen). Sensitivity and subtlety don't usually have much of a place in caricaturing, especially when the artist's negative feelings towards the subject have an influence on the level of exaggeration. I know the likeness isn't 100% there, but I think there is a likeness. The difference is someone who thinks she may be beautiful or talented (I don't) would have been a lot kinder in their depiction. I think that's the root of your negative response. I think she's great. I mean in your version. Likeness is obvious. I like her in some films, she has great comic timing, but i don't like her when she gets serious. Just wanted to let you know that moviepilot.com is using this amazing artwork without crediting. Thanks for letting me know, Christine.